As analysts, we’re supposed to dig deep in a company’s accounting. In a lot of mutual funds and on the sell-side, analysts don’t even try. They see it as their job to forecast headline EPS numbers. When a stock market resembles what Keynes referred to as a musical chairs game, the main objective is to second guess other investors. I’m suppose that’s why poor accounting lives on. One of the biggest issues I’ve seen in emerging markets is how analysts don’t make adjustments when companies are borrowing in foreign currencies. It’s common for capital intensive companies in Indonesia, or Philippines or China to borrow in US Dollar to fund their domestic operations. Local debt markets may not be deep enough to handle the borrowing needs of major corporations. And foreign debt tends to look “cheaper” in the eye of the borrower. I have seen first hand how companies think they have made a great deal borrowing at 6-7% in US Dollar terms instead of 12% in Rupiah, without thinking about currency risks. Who thinks about currency risks when currencies have been rising for 10 years in a row? In their P&L forecasts, analysts almost never assume any losses from currency depreciation, foreign currency movements are simply taken as an exogenous variable. It’s a big issue. Professor Huyn Song Shin at Princeton argues that our current credit boom has been driven by lending across borders in a search for yields, primarily in the bond market. Pension companies need to match liabilities with defined benefit schemes. Insurance companies are also engaged in asset liability management. And feeling loss aversion from falling interest rates, retail investors have gone into higher yielding and higher risk investments now that their bank accounts only give 0% (ignoring currency risks, default risks and low inflation in developed markets). Perhaps that is the reason why Chinese property companies could borrow in US Dollar terms for just 5-6% a year ago despite a terrible industry dynamics and a poor macroeconomic backdrop. But all types of silly lending must one day come to an end and this will prove no exception. It comes from Air China’s 2014 annual report. 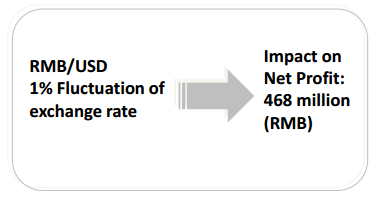 Every 1% fluctuation in the exchange rate leads to a CNY 468 million impact on the bottom line. Not small, given that total profits were CNY 4.3 billion last year. So every percentage point decrease in the exchange rate gives rise to a 11% drop in net income. This becomes particularly concerning after the 3% drop in the CNY fixing last month. It may seem like a small issue. But what if a 3% devaluation has knock-on effects, including carry trade reversals and local elite taking money out of the country? China has had a very large increase in the real effective exchange rate over the last couple of years. It seems that the RMB is overvalued and the market wants it to go down. That is an issue for a company such as Air China. In 2013 when the RMB rose 3% against the US Dollar, Air China made a CNY 1.9 billion foreign exchange gain. If foreign exchange gains and losses are taken symmetrically, this year’s 2.7% depreciation of the RMB will lead to an FX loss of CNY 1.8 billion. Even if they hedge, the cost has to be taken by someone. The company has CNY 80 billion in debt, almost half of it unsecured. CNY 49 billion of total debt comes is US Dollar funded and the remainder mostly in RMB. The fixed rate bank loans have historically cost 2.5% to 4.5% whereas RMB bank loans cost 5.0 to 7.0%. So by accessing US Dollar loan market Air China has lowered its total interest expense by 2.0 to 2.5 percentage points. I am not an airline expert and perhaps the asset-backing of Air China’s USD and RMB loans are different. After all, airplanes are commodities that could easily be sold on the international market. 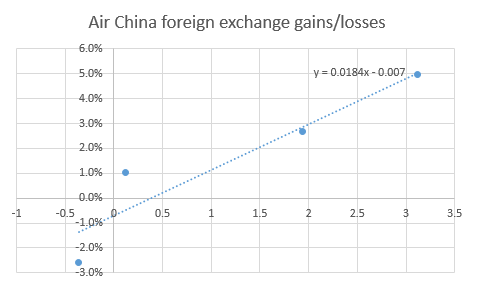 Historically though Air China has made decent FX gains when the currency has been rising. Logically, the opposite should happen now that the RMB has started to correct. And hence, the income statement must be adjusted. Suppose that Air China, instead of borrowing in US Dollar chose to borrow locally at a 2.5 percentage point higher interest rate. This would wipe out CNY 1.8 billion or 42% of 2014 net profits. Then suddenly Air China wouldn’t be trading at 22x 2014 earnings but rather 44x 2014 earnings. Consensus numbers for 2015 indicate profits are expected to double, because of strong FY1H16 results and low kerosene prices. I am not shorting the stock actively but may do so at some point (the bear case includes all-time high margins, FX risk and supply coming onstream). Another case of improper accounting for FX risks in the income statement is Nine Dragons Paper, listed in Hong Kong. The company was hailed as a miracle in the mid-2000s as the company grew from nothing to one of the biggest paper producers in China. They import waste paper from the West in empty containers and process them for production of packaging paper. It all looks fine until you look at the balance sheet. They have CNY 33 billion in debt against CNY 7 billion in cash and about CNY 5 billion in EBITDA. 2/3 of this debt is in US Dollars while their revenues are primarily in Renminbi. So Nine Dragons Paper is paying 2.6% to 2.9% in interest rates for short- and long-term US Dollar borrowing. Not bad for a highly capital intensive paper producer with a net debt/EBITDA ratio of 5x. Even if you assume the EBITDA margin goes from current 18% to the historical median of 19%, the net debt/EBITDA ratio will still be well over 4x. As a comparison, International Paper Co pays 6-8% for its debt, and bear in mind that International Paper is an investment grade credit. Let’s assume that the interest rate Nine Dragons Paper is borrowing at increases by 3 percentage point. What happens to profits? It turns out that net profit would fall more than 50% and the stock would be trading at 22x FY2014 profits. Nine Dragons Paper also has other issues. It’s cyclical, for one. Paper production machinery runs 24 hours a day, so in a downturn it is hard to cut costs by shutting them down. 50% of the raw materials in COGS are acquired by a related party owned by the chairwoman, at prices determined by her. Who lends at 2.6-2.9% in US Dollar terms to such a company? It turns out that the lenders are the biggest state-owned banks in China: Bank of China, Bank of Communications, China Development Bank, Agricultural Bank of China and China Merchants Bank. Or to be more precise, the lenders were the Hong Kong branches of these state-owned banks. 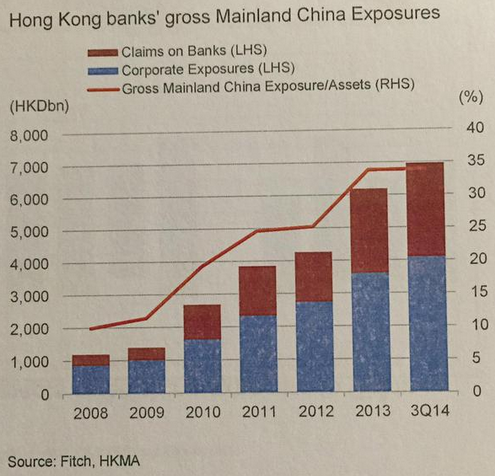 The gross mainland exposure of Hong Kong banks have risen from almost nothing to 40% of total banking assets today. The banks doing the lending are not so much local banks such as BEA but rather Hong Kong branches of Chinese state owned banks. They borrow US Dollars or Hong Kong Dollars and lend (primarily) to mainland SOEs. The banks themselves may be hedging their currency exposure, but from what I’ve seen corporate debtors are unlikely to hedge their exposure. This increases the credit risk substantially. When I mention this phenomenon to friends in the industry, they say that I may be right but that the Chinese Big 5 banks are fully backed by the government. They Chinese Communist Party will never let any big company fail. If China goes into a recession or the RMB falls and a company goes into default, equity holders won’t lose. The banks will just continue lending. The banks won’t fail as they are backed by the government. And the RMB won’t fall as the capital account is supposedly closed. It’s the best of all possible worlds. China’s budget deficit is not the headline 2.1%, given that it is a backstop of all banks, wealth management products, local government debt, SOE debt and even private sector debt in some cases. Do proper adjustments and you’ll get to budget deficit/government expenditure levels much higher than Japan, for example. That may be an issue for the RMB, at least if depositors start to lose faith in political stability and/or the currency. Add to that a FX reserves/M2 ratio of just 17% and it may be time to start worrying about the value of the RMB. Income statements should be adjusted when companies are on the borrowing side of carry trades. Over the long run, currencies with permanently higher interest rates and inflation will depreciate against developed market currencies. So borrowing in US Dollar will not be a win-win strategy. I tend to assume emerging market companies will need to pay their domestic borrowing rates sooner or later. Particularly when global liquidity is at risk of contracting, a global reserve drawdowns have begun to indicate. Let’s see how all of this plays out.